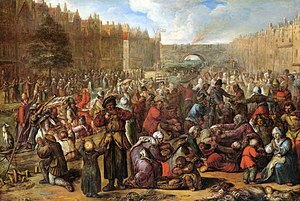 ↑ The Dutch States-General, for dramatic effect, decided to promulgate the ratification of the Peace of Münster (which was actually ratified by them on May 15, 1648) on the 80th anniversary of the execution of the Counts of Egmont and Horne, June 5, 1648. See Maanen, H. van (2002), Encyclopedie van misvattingen, Boom, p. 68. ISBN 90-5352-834-2. หน้านี้แก้ไขล่าสุดเมื่อวันที่ 7 มีนาคม 2558 เวลา 04:58 น.